The founders of KISES, work directly with the families in Need, in the villages and communities of Vijayawada, Andhra Pradesh. They have already done so much transparently, with minimum administration costs. KISES UK has been set up to raise funds for their next projects. We think they are awesome! 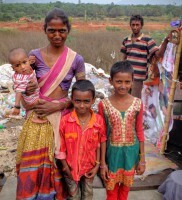 We are asking for sponsors to come forward to sponsor all 50 families at Vijayawada City Dump; at a cost of £120 (just £10 a month) to cover the most basic needs, including a tent, bedding, cooking vessels, clean clothes, breakfast with milk and midday meals. Click here to link to the Sponsor page. KISES India NGO has been set up by the poor for the poor. The founder, Mr Shoury Babu is from a lower middle caste community (Dalit), he knows the villagers by name and talks to them about their problems and understands the help that they need. Charity in India is unfortunately wrought with corruption with reports that only 10% of funding actually getting to the intended goal. KISES has experience of delivering projects with complete transparency with a large international international charity. All transactions will monitored from UK. Volunteers are needed in UK, India and rest of world, to help spread the word. promote the work and generate funding. Funds are desperately needed to continue the great work that KISES is doing. If you have time and skills to offer to develop the fantastic work that is being done.